which has perfectly fair play for all people, regardless if they have sight or not. I recently took on the challenge of creating a game that could be played by sighted and sight-impaired players alike, with no advantage to either player. I am happy to announce that I have created an epic strategy board game for all, including the sight-impaired community. The game is easy to play. 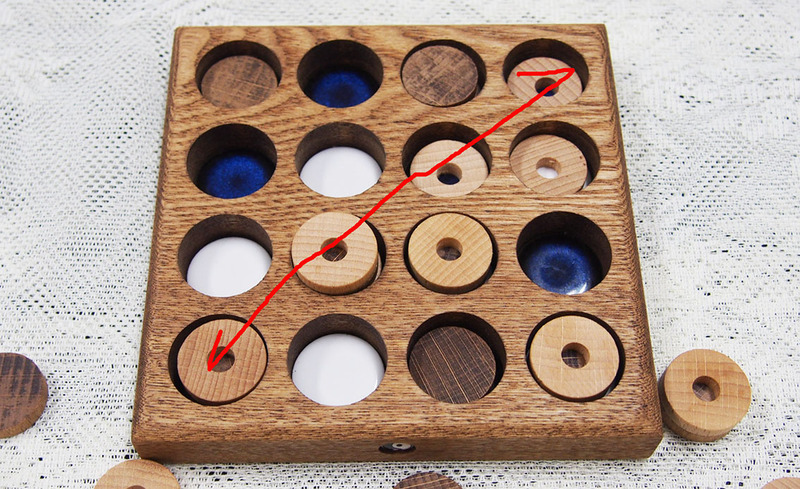 The goal is to make 4 in-a-row or 3 rising steps, by placing pieces on the board. 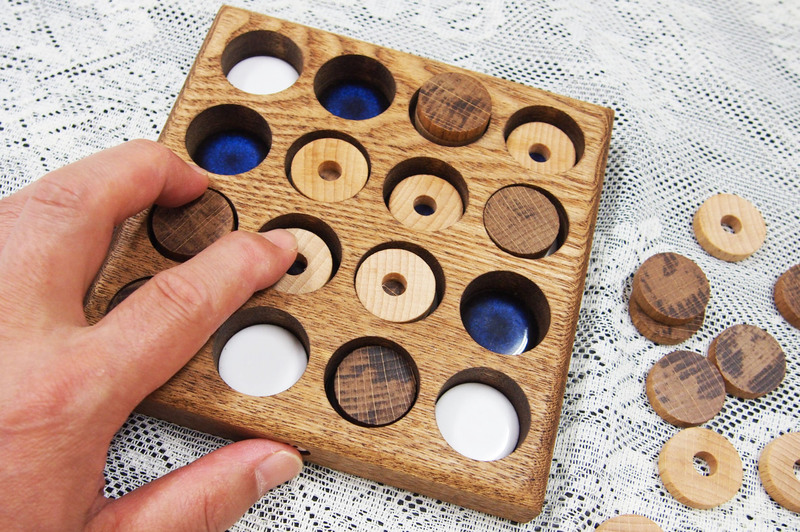 ●This is a highly tactile and physical game with ceramic and wooden pieces that is based on touch and does not rely on artificial sound effects. 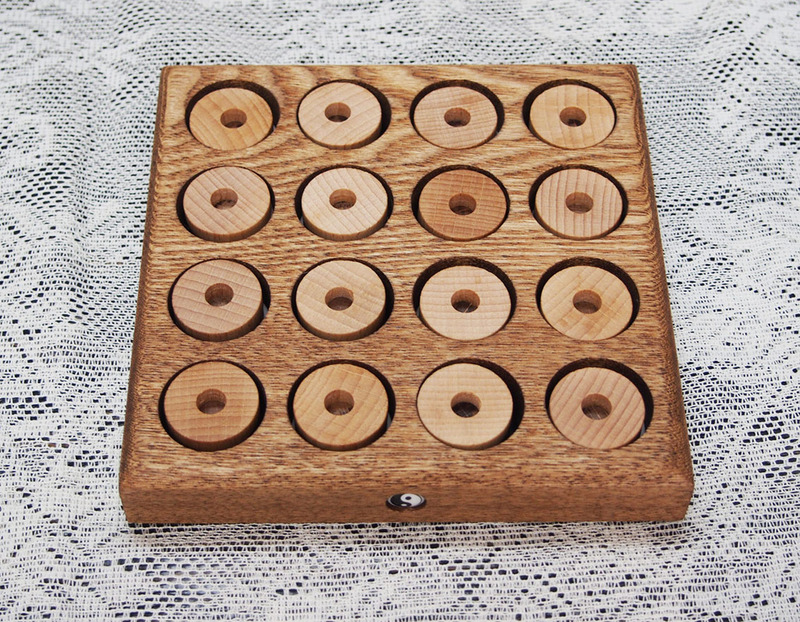 ●The board structure is designed to aide sight-impaired players. 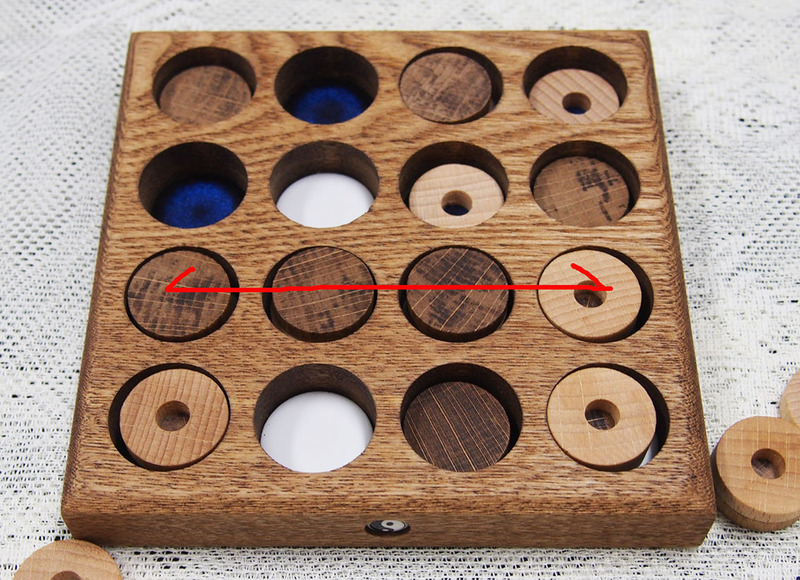 ●Holes on the board easily indicate where players can legally place their pieces. 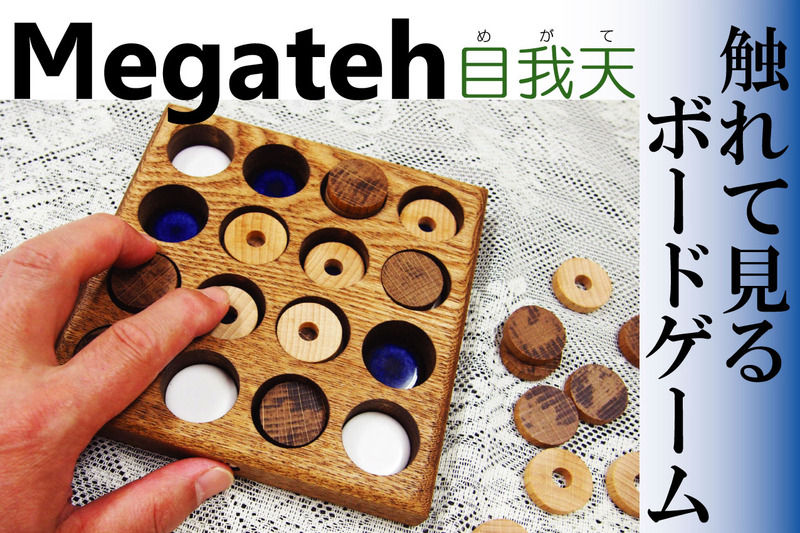 The game Megateh（めがて：目我天）is designed so everyone can enjoy it perfectly, even if playing by touch alone. Whether you and your friends are sighted or sight-impaired, this game provides a fun evening of strategy, gaming and conversation. 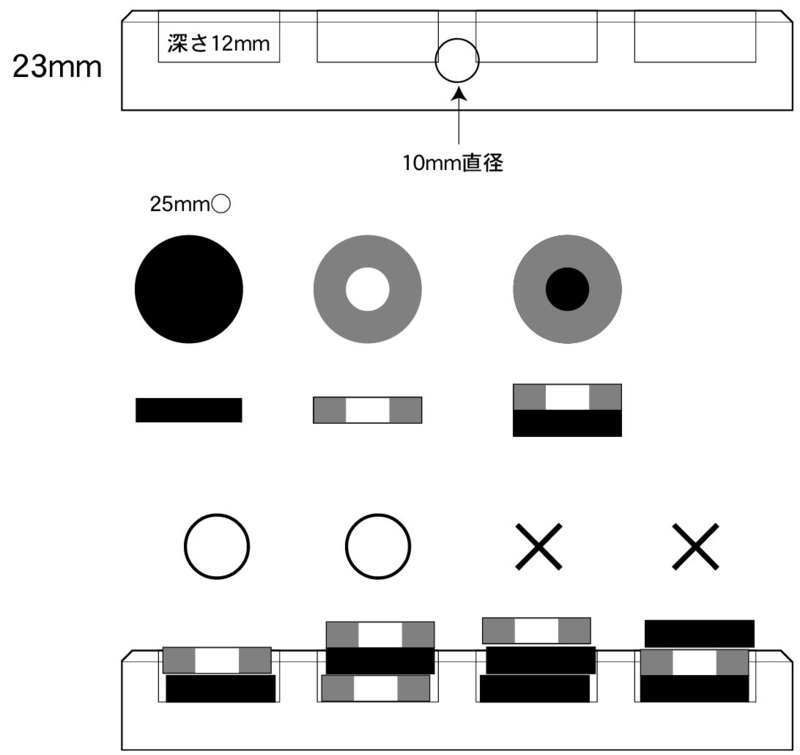 【Pieces】　8 “single level” flat disks, 8 “single level” holed disks and 8 reversible “two levels” discs - flat on one side, holed on the other. 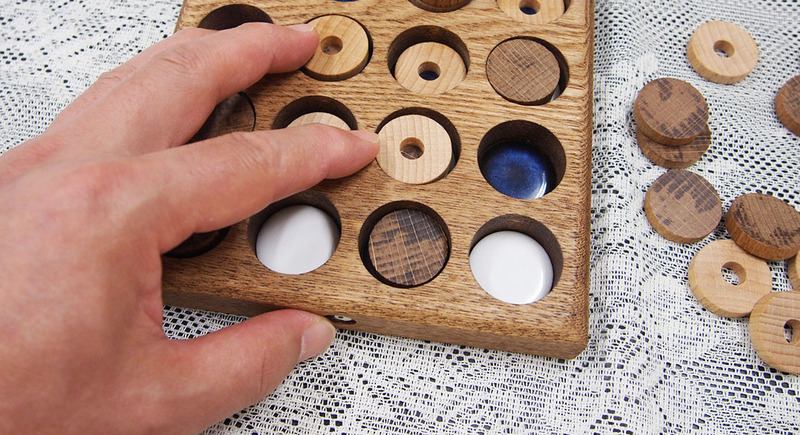 ●Players take alternating turns, placing unused discs into any open space on the board. ●Players may also stack discs by placing any “single level” piece on top of another “single level” disc already placed (so creating two levels of height). ●Players can also place a “two level” disc on top of an already placed “single level” disc (so creating three levels of height). ●Please Note that placing a “single level” piece on top of a “double level” piece is NOT allowed. ●No more than two pieces can be stacked on top of each other. If, on your turn, any of these three conditions are met you win the game. (For three or more players, you score points over each game to win the match). Each of three conditions can be accomplished through horizontal, vertical, or diagonal placement. 1： Creating three steps in the order of single, double and triple height, regardless of the discs’ faces (flat or holed). You achieve this by placing and stacking discs. 2：Creating “four in a row” of the same height level (single, double or triple) regardless of the discs’faces. 3： Creating “four in a row” with the same “top facing” figure regardless of height level. For each game, the starting player changes. Once every player has started one game, the match ends with the last game. Players receive points at the end of each game. When the match ends, points are added up and the highest total score wins. The winner of the game receives 5 points when they place a disc that wins the game. The loser of the game is the player who plays immediately before the winning turn. The loser receives 0 point. All other players receive 3 points. ●Players can get all perfect information for playing by touching. ●Tree king of disks are very easy to distinguish by touching. 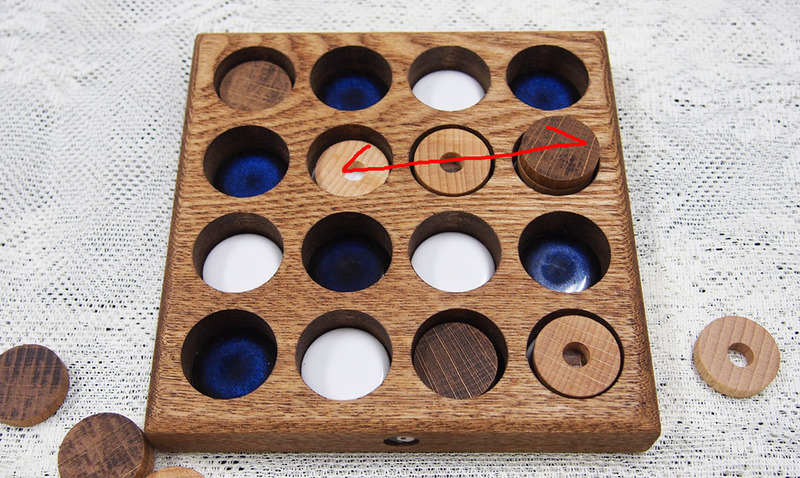 ●Holes on the board indicate where the discs can be placed and keep them from moving if touched. ●here is a small tile inlaid on the side of the playing board. This is not for decoration. Players know the board orientation by touching it, even if an opponent turns the board. ●All pieces settle on the board perfectly. You can easily notice where discs are missing, to decide where to play. Pieces do not get stuck in the board. I am going to launch this project on Kickstarter this coming Autumn 2017. Stay tuned for more details!